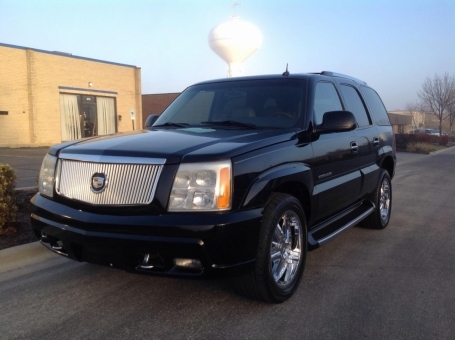 This 2003 Cadillac Escalade is a full size crossover SUV with a powerful V8 engine, spacious and comfortable interior, and plenty of outstanding features. The Escalade has masculine good looks, plenty of power, luxury, and performance which makes it a wonderful choice among full size SUV's. This is a terrific " road trip " vehicle, it roomy, comfortable, and has many entertainment options. ." Options include DVD player for on board entertainment with a remote control, power seats, windows, mirrors, locks, chrome wheels, dual,climate control, heated seats, Mastercraft and Cooper tires, roof rack, rear spoiler, towing ability, running boards, AM-FM stereo with CD player.